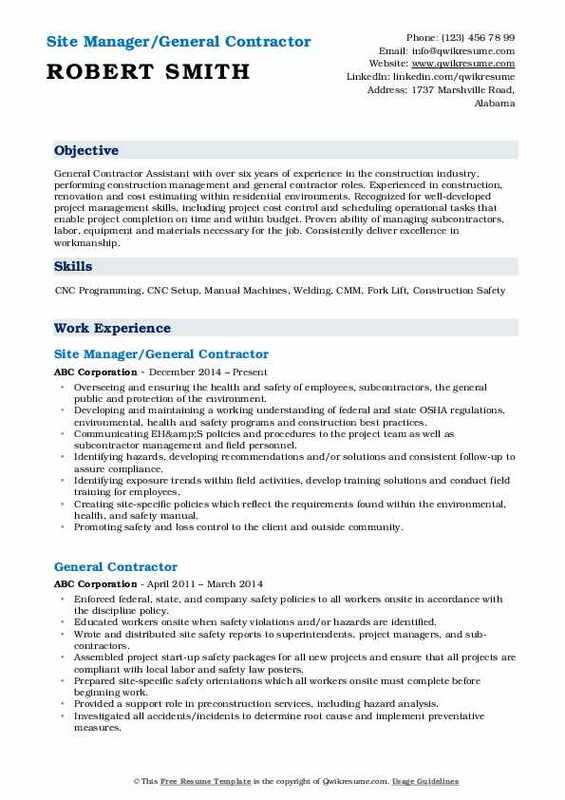 A General Contractor undertakes the task of hiring and organizing workers needed to work at construction sites. The job description includes buying materials, obtaining necessary permits, complying with building codes and overseeing the contract through to completion. 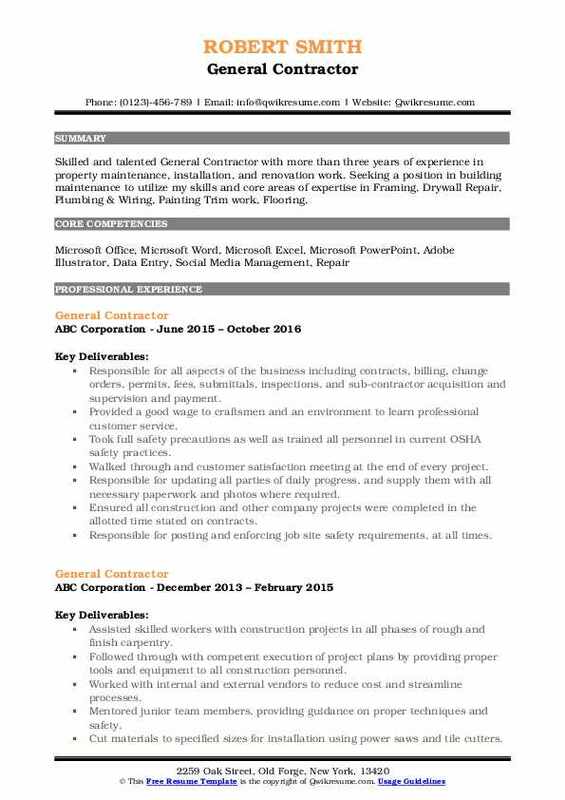 The General Contractor Resume gives a list of the following duties and tasks – delegating work among employees, maintaining stock supplies, providing all needed materials, labor and tools for the contract; ensuring working within the budget and making sure all workers abide with the safe and orderly work orders. The job duties vary based on the type and size of the contract undertaken, but the following skills are mandatorily required despite any variables – ability to read blueprints, a good understanding of construction; business acumen, commercial awareness, math skills, updated knowledge of all code requirements and experience with commercial projects. A Degree is not necessarily required; however, trade skills are a must. 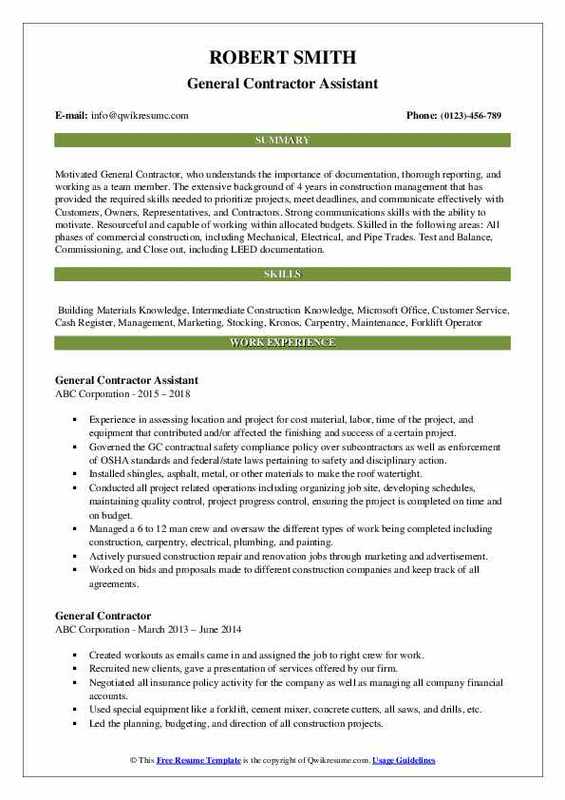 Headline : Seasoned, results-producing General Contractor with experience directing aspects of operations, administration, and equipment maintenance. Success orchestrating multiple projects with competing priorities involving program development, safety initiatives, and quality control. Effectively collaborate with both domestic and international groups to achieve organizational objectives. Worked with the primary subcontractor and architects to design the physical structure. Installed flooring, floor coverings, hardwood, vinyl, carpet, floor epoxy. Interviewed and hired subcontractors after evaluating bids, and supervised their work on the project to ensure that it was completed per specifications. Worked with local utility representatives to arrange all utility services. Properly equipped all roofers with safety equipment, scaffolding, and hoists. Responsible for general construction including renovations and new construction, framing, minor electrical, plumbing, and insulation work. Responsible for the supervision and scheduling of subcontractors ensuring compliance with all codes. Drafted & designed small scale projects, providing plans, material lists, and budgets. Summary : General Contractor who has been in the construction industry for over 40 years. Working in all areas from labor to Management. 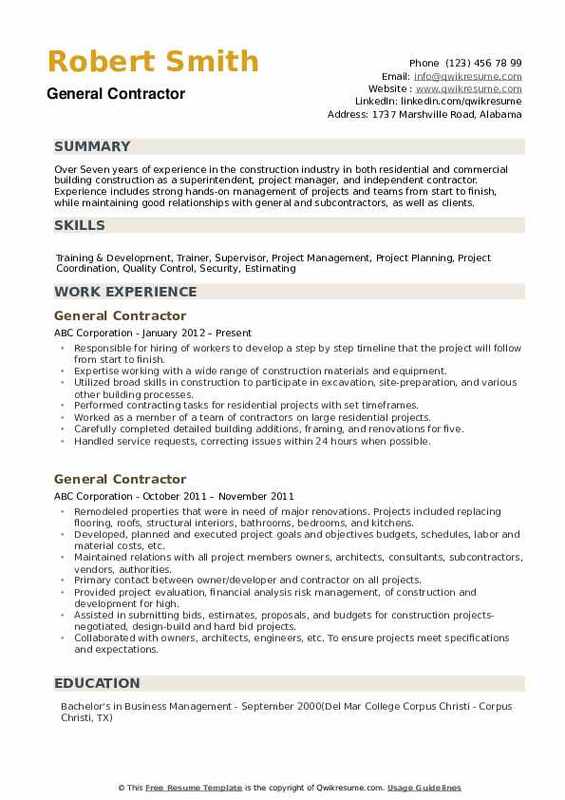 Service-oriented craftsman with a background in general labor. Core competencies include problem-solving, dependability and vast knowledge of material handler job requirements as well as excellent communication and time management skills. Handles tasks with accuracy and efficiency. Carefully coordinated plans and specs using marketing programming standards. Stayed consistent with project schedules and plans for all FFE installations. Acted as the liaison between landscape architects and the general contractors. Followed through with competent execution of project plans by providing proper tools and equipment to all construction personnel. Performed construction site pre-inspections and coordinated post-construction audits. Accurately provided status information on project progress to the project manager. Efficiently recorded and rejected incorrect deliveries of material to the site. Led and managed the resolution of all issues during project construction and commissioning phases. Objective : Motivated General Contractor, who understands the importance of documentation, thorough reporting, and working as a team member. The extensive background of 4 years in construction management that has provided the required skills needed to prioritize projects, meet deadlines, and communicate effectively with Customers, Owners, Representatives, and Contractors. Strong communications skills with the ability to motivate. Resourceful and capable of working within allocated budgets. 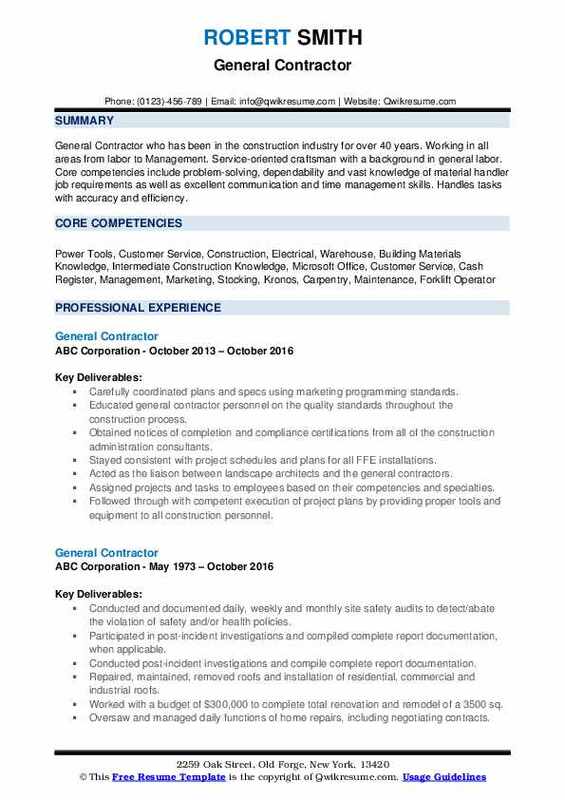 Skilled in the following areas: All phases of commercial construction, including Mechanical, Electrical, and Pipe Trades. Test and Balance, Commissioning, and Close out, including LEED documentation. Experience in assessing location and project for cost material, labor, time of the project, and equipment that contributed and/or affected the finishing and success of a certain project. Governed the GC contractual safety compliance policy over subcontractors as well as enforcement of OSHA standards and federal/state laws pertaining to safety and disciplinary action. Installed shingles, asphalt, metal, or other materials to make the roof watertight. Conducted all project related operations including organizing job site, developing schedules, maintaining quality control, project progress control, ensuring the project is completed on time and on budget. Managed a 6 to 12 man crew and oversaw the different types of work being completed including construction, carpentry, electrical, plumbing, and painting. Actively pursued construction repair and renovation jobs through marketing and advertisement. Worked on bids and proposals made to different construction companies and keep track of all agreements. Acted as representative for the company and disseminated information on program development. Summary : Solution-focused General Contractor with over 20 years of time proven experience and knowledge in residential and commercial construction, custom renovations tenant improvements and remodels as well as land development, road construction, and underground utilities. Well Versed in leading and directing employees and contractors in the planning and execution of large-scale projects, with a focus on on-time and on--budget completion. Able to meet schedules and client special requirements and needs. While able to implement corrective measures when needed in a timely fashion. Skilled in resolving project obstacles and getting problematic projects back on track. Implement construction management and quality control processes that ensure adherence to design requirements and applicable codes during procurement and all phases of construction. Prepared all the comprehensive job cost estimates, proposals, payment requests and change order requests. Anticipating potential project delays and resolving them in advance has been a key to my success. Developing plan drawings related to large and small construction projects. Engaged in quality control and quality assurance activities on all my company's projects. Developed a good rapport with many of the local vendors and sub-contractors and have an A+ rating with the BBB. Oversaw eight simultaneous ground-up renovations of residential properties located throughout the south king county area, while ensuring compliance to all city code inspections. Monitoring and updating project schedules to ensure all milestones and deadlines are met. Leading project progress and coordination meetings and coordinate with project superintendents. Summary : Highly qualified General Contractor with management and project management experience 18 + years of Supervisory experience. 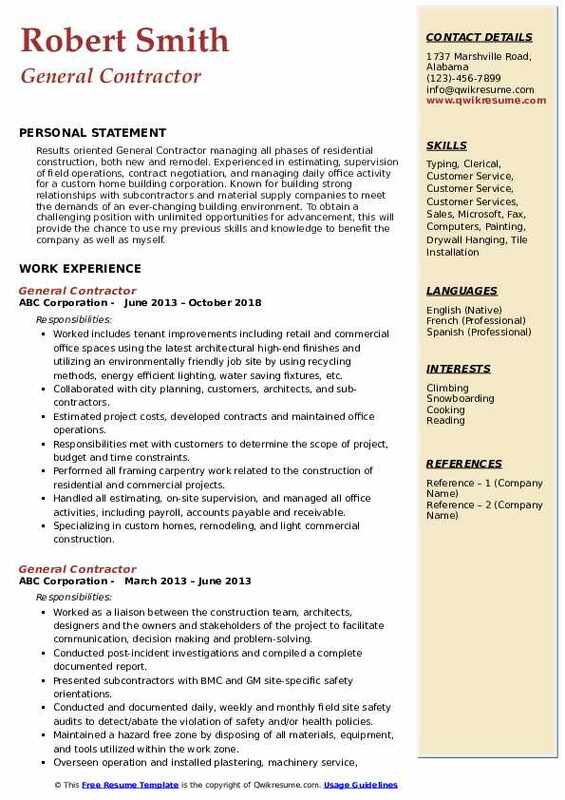 Extremely resourceful with a niche for efficiency and accountability Self-motivated and capable of working in a fast-paced environment that demands strong organizational, technical, and interpersonal skills, Confident and poised in interactions with individuals at all levels. And can utilize my bilingual skills. Experienced, bilingual field technician in the communication industry seeks opportunity to expand current skill set in a fast-paced environment. Skills : Safety And CPR Training. Trained In Office 2013, Inventory Management, Problem Solving, Personnel Management. Evaluated pricing of properties and remodeling contracts according to the conditions of real state and the execution schedule proposed. Developed and implemented procedures for purchasing, repairing and sell houses, managing all activities related to purchasing and sale contracts as wells as loans and grants applications with professional loan officers and realtors, carrying out related public relations and customer service. Planned and inspected residential properties to be remodeled and performed a variety of technical duties in the administration of contracts and procurement of materials, equipment, and services. Responsible for timely delivery of materials with the required quality and within budget. Provided families and employees with information on current and future projects. Responsible for timely and cost-effective completion of general construction projects. Responsible for strategizing, implementing, controlling, and analyzing projects from start to finish. Added new ways of analyzing the labor processes on all projects to find new more efficient ways of looking at things. 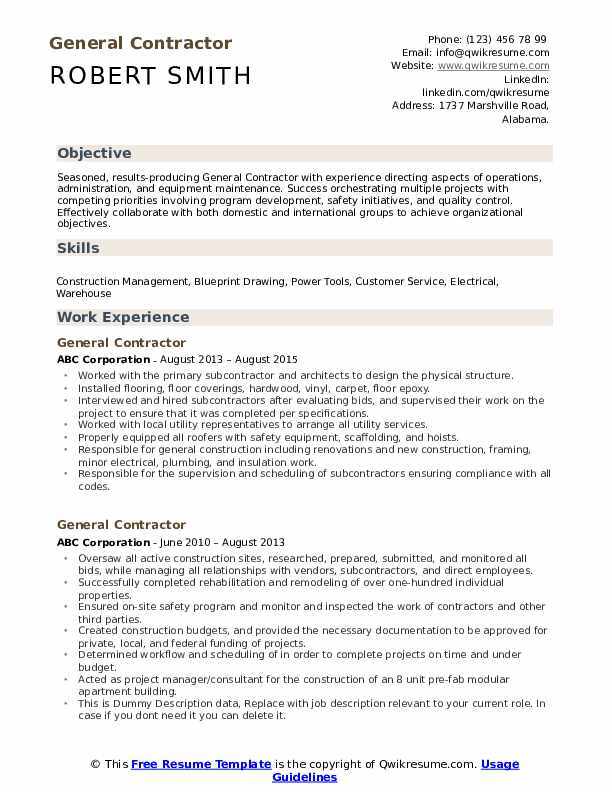 Headline : General Contractor Assistant with over six years of experience in the construction industry, performing construction management and general contractor roles. Experienced in construction, renovation and cost estimating within residential environments. Recognized for well-developed project management skills, including project cost control and scheduling operational tasks that enable project completion on time and within budget. Proven ability of managing subcontractors, labor, equipment and materials necessary for the job. Consistently deliver excellence in workmanship. Overseeing and ensuring the health and safety of employees, subcontractors, the general public and protection of the environment. Developing and maintaining a working understanding of federal and state OSHA regulations, environmental, health and safety programs and construction best practices. Communicating EH&S policies and procedures to the project team as well as subcontractor management and field personnel. Identifying hazards, developing recommendations and/or solutions and consistent follow-up to assure compliance. Identifying exposure trends within field activities, develop training solutions and conduct field training for employees. Creating site-specific policies which reflect the requirements found within the environmental, health, and safety manual. Promoting safety and loss control to the client and outside community. Providing residential maintenance services and fix household appliances and structures. 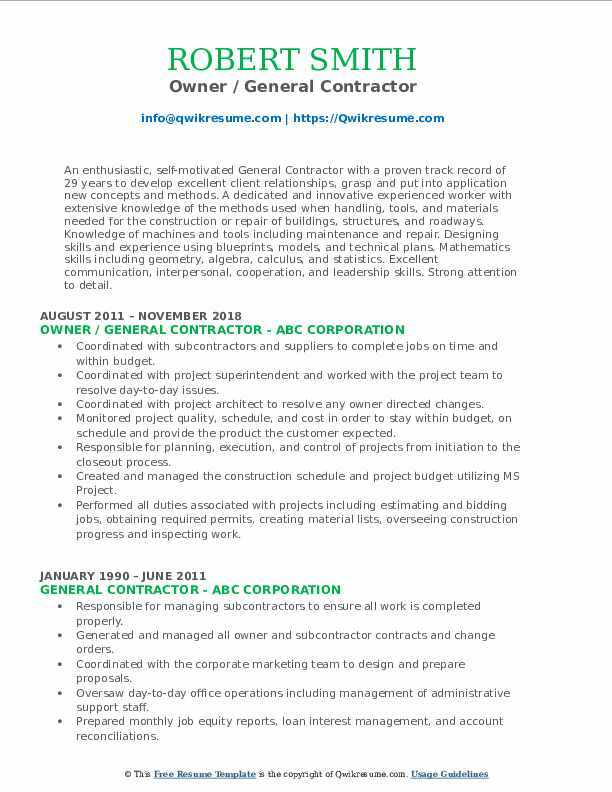 Summary : An enthusiastic, self-motivated General Contractor with a proven track record of 29 years to develop excellent client relationships, grasp and put into application new concepts and methods. A dedicated and innovative experienced worker with extensive knowledge of the methods used when handling, tools, and materials needed for the construction or repair of buildings, structures, and roadways. Knowledge of machines and tools including maintenance and repair. Designing skills and experience using blueprints, models, and technical plans. Mathematics skills including geometry, algebra, calculus, and statistics. Excellent communication, interpersonal, cooperation, and leadership skills. Strong attention to detail. Coordinated with subcontractors and suppliers to complete jobs on time and within budget. Coordinated with project superintendent and worked with the project team to resolve day-to-day issues. Coordinated with project architect to resolve any owner directed changes. Monitored project quality, schedule, and cost in order to stay within budget, on schedule and provide the product the customer expected. Responsible for planning, execution, and control of projects from initiation to the closeout process. Created and managed the construction schedule and project budget utilizing MS Project. Performed all duties associated with projects including estimating and bidding jobs, obtaining required permits, creating material lists, overseeing construction progress and inspecting work. Prepared written contracts for proposals and invoices using Microsoft Office. Objective : Skilled and talented General Contractor with more than three years of experience in property maintenance, installation, and renovation work. 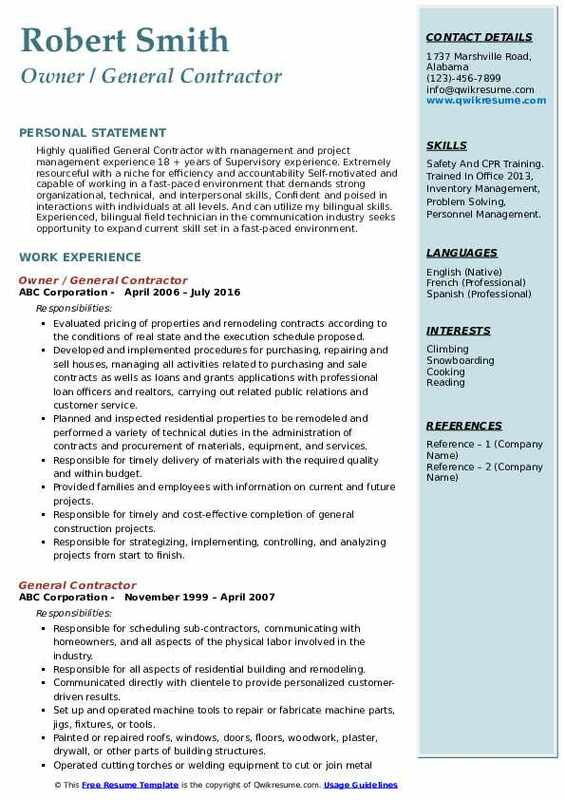 Seeking a position in building maintenance to utilize my skills and core areas of expertise in Framing, Drywall Repair, Plumbing & Wiring, Painting Trim work, Flooring. Responsible for all aspects of the business including contracts, billing, change orders, permits, fees, submittals, inspections, and sub-contractor acquisition and supervision and payment. Provided a good wage to craftsmen and an environment to learn professional customer service. Took full safety precautions as well as trained all personnel in current OSHA safety practices. Walked through and customer satisfaction meeting at the end of every project. Responsible for updating all parties of daily progress, and supply them with all necessary paperwork and photos where required. Ensured all construction and other company projects were completed in the allotted time stated on contracts. Responsible for posting and enforcing job site safety requirements, at all times. Extensively trained in framing, carpentry, painting, drywall/spackling, flooring, tiling, and electrical. Headline : Results oriented General Contractor managing all phases of residential construction, both new and remodel. Experienced in estimating, supervision of field operations, contract negotiation, and managing daily office activity for a custom home building corporation. Known for building strong relationships with subcontractors and material supply companies to meet the demands of an ever-changing building environment. To obtain a challenging position with unlimited opportunities for advancement, this will provide the chance to use my previous skills and knowledge to benefit the company as well as myself. Worked includes tenant improvements including retail and commercial office spaces using the latest architectural high-end finishes and utilizing an environmentally friendly job site by using recycling methods, energy efficient lighting, water saving fixtures, etc. Collaborated with city planning, customers, architects, and sub-contractors. Estimated project costs, developed contracts and maintained office operations. Responsibilities met with customers to determine the scope of project, budget and time constraints. Performed all framing carpentry work related to the construction of residential and commercial projects. Handled all estimating, on-site supervision, and managed all office activities, including payroll, accounts payable and receivable. Specializing in custom homes, remodeling, and light commercial construction. 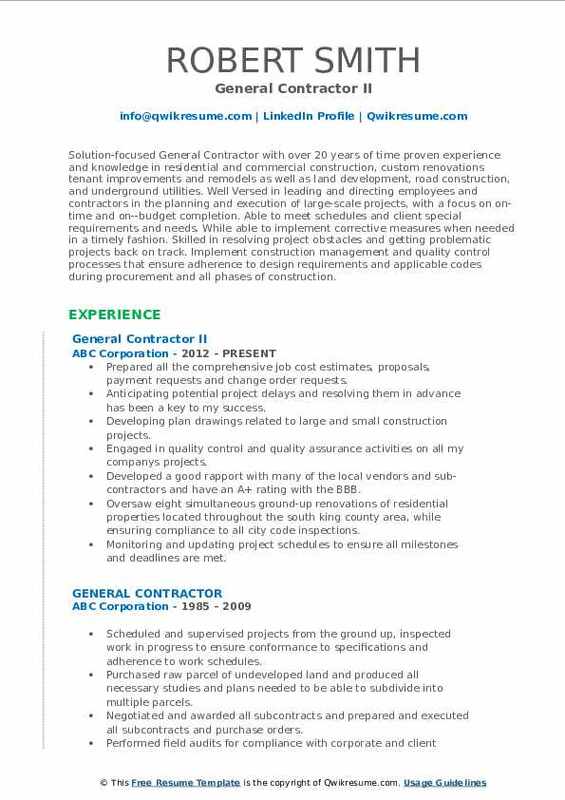 Summary : Over Seven years of experience in the construction industry in both residential and commercial building construction as a superintendent, project manager, and independent contractor. Experience includes strong hands-on management of projects and teams from start to finish, while maintaining good relationships with general and subcontractors, as well as clients. Responsible for hiring of workers to develop a step by step timeline that the project will follow from start to finish. Expertise working with a wide range of construction materials and equipment. Utilized broad skills in construction to participate in excavation, site-preparation, and various other building processes. Performed contracting tasks for residential projects with set timeframes. Worked as a member of a team of contractors on large residential projects. Carefully completed detailed building additions, framing, and renovations for five. Handled service requests, correcting issues within 24 hours when possible. Ensured all make-ready repairs and services are completed correctly and on schedule for current and incoming residents.